Surface Hub does not connect to on-premise file servers. HubFile and Shorty solve that. Used more than 5000 times a week by users all over the world. 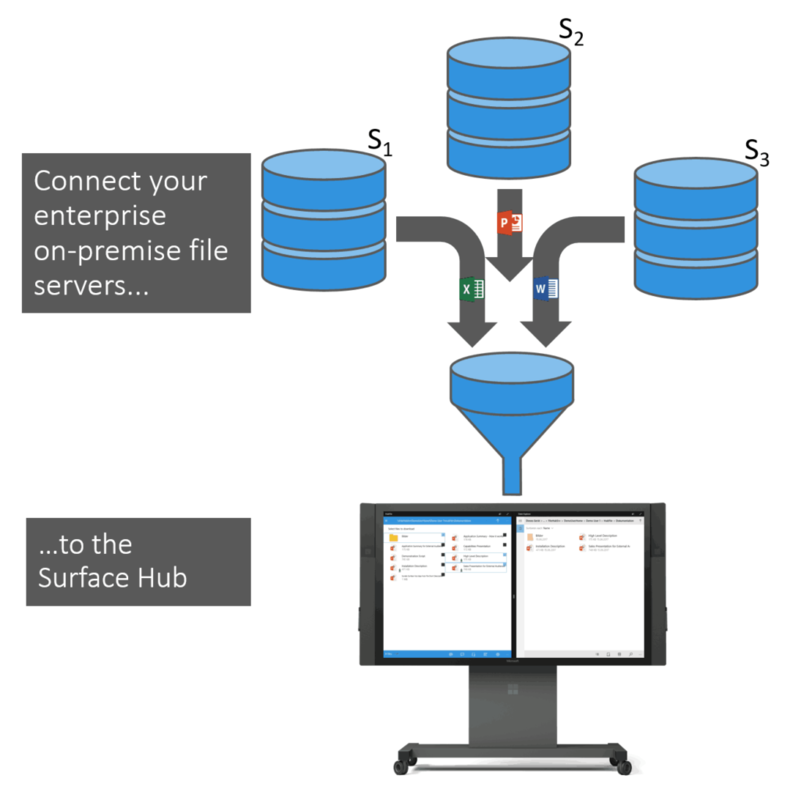 HubFile connects Surface Hub with on-premises file servers. 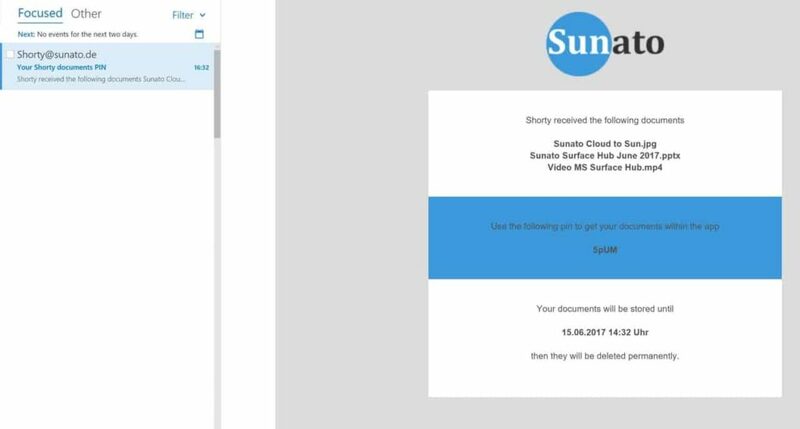 Shorty let´s users send their documents via eMail to Surface Hub. As easy as writing eMails. HubFile enables users to access on-premises fileshares. 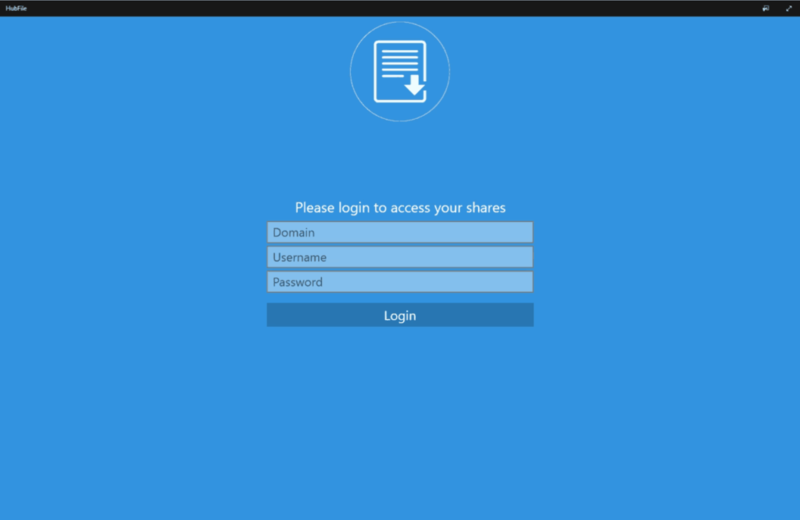 In the HubFile app on Surface Hub enter your enterprise domain, username and password. Browse through your folders and find your files. Select one or more files and folders. Press the download button and select the target download location. You are done! Send a mail to Surface Hub. Attach your documents. You get a PIN via Mail. 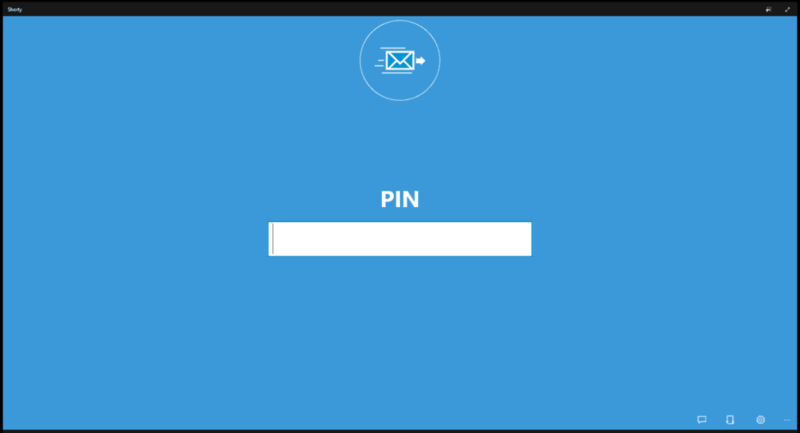 On Surface Hub, start Shorty and input your PIN. Your documents will be copied to Surface Hub. You can open them via Surface Hub´s Explorer App. Or enter further PINs to download more documents. For presenters it is easy. And the way, you are used to! Our goal was to make it as easy as possible for you to download huge amounts of data of any kind from file servers to Surface Hub. It work´s in the way you are used to: After starting HubFile, you enter your credentials as you do it every morning on your computer … and voilá all your files are there! HubFile looks very similar to the well-known Windows Explorer App. You just have to select files or folders and press the download button. That´s it. You can start your presentation right away. 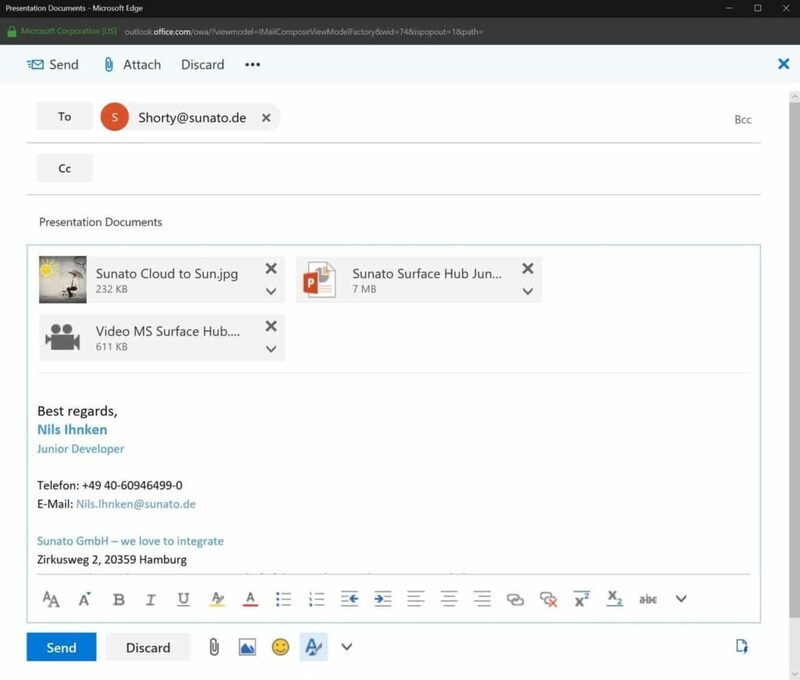 Send a mail with your documents to Surface Hub. Shorty will do the work for you. You receive an individual PIN code in return. Once you are ready to present, enter your PIN code in the Shorty App on the Surface Hub and Shorty will hand you your files. Shorty will invalidate your PIN after a predefined number of days and make sure that no one else has access to your data by encrypting end-to-end. Administrators can expect minimal impact in the backend. 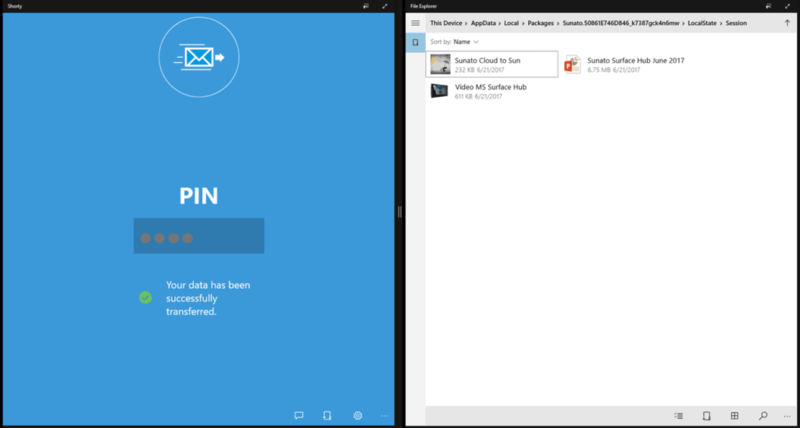 HubFile is a Universal Windows Platform App (UWP-App) that uses the HubFile Backend-Service (a Webservice) to enable users accessing their on-premise file servers. We expect the Backend-Service will be run on-premise in most scenarios. HubFile´s backend service will use the user`s AD credentials to authenticate him at the enterprise on-premises file server. Our backend service will process the folder structure and meta information to Surface Hub. After clicking to download one or multiple files the backend service copies those to the user´s directory on Surface Hub. As an administrator, you roll out the HubFile Webservice on any Windows Server and configure the available network paths that users shall see via HubFile. That´s it. Shorty is a Universal Windows Platform App (UWP-App) that uses the Shorty Backend-Service (a Webservice + a SQL database) to enable users sending documents via Mail to Surface Hub. The Backend-Service can be run on premises or on Azure. The app-language can be switched to English or German (other languages could be implemented quickly if necessary). The Shorty backend service will register the ingoing e-mail and will process the documents to the Surface Hub by putting it into a SQL database. In order to locate the users files an e-mail with an individual PIN code is generated and returned. Once the PIN was entered on the Shorty App, the backend service will process the with the PIN code associated files from the database to the Surface Hub. For roll-out, we configure the Shorty webservice that monitors the new Shorty@YourCompany.com mailbox on your Exchange Server or Exchange online tenant. Plus we implement a Shorty database on an existing SQL Server or as an SQL Service in your Azure tenant. That´s it. You may additionally configure a mail template for the PIN mails including your logo and how long the documents shall be stored / the PIN shall be valid. Licensing our apps is easy. You pay a montly (or annual) rate per Surface Hub. You get the app plus a high level description. If you want to roll out on-premises, you also get the backend services plus an installation/ setup manual. We offer remote support for rolling out the on-premise backend services. There are discounts available if you license the apps for 10, 50, 100 or more Surface Hubs. Request an offer by sending an email with your contact data and the number of Surface Hubs by filling out the contact form at the end of this site. Easy to use: Look&Feel similar to the File Explorer app of Surface Hub. No teaching necessary. Safe: No extra rights management necessary: HubFile takes the user`s AD credentials to authenticate him at the enterprise on-premises file server. Easy to administrate: HubFile backendservice runs on any Windows Server and is quickly configured. Unlimited: Download documents of almost any size to Surface Hub (tested for up to 4GB of size per file). Easy to use: If your users can send eMails, they are able to use Shorty! Easy to administrate: Shorty backendservice runs on any Windows Server and is quickly configured. Limited: document-size is limited to the file size restrictions of the mail-servers in your company. No need for Windows 10 – any device possible: Windows 98, iPhone, whatsoever … any device can be used to send data. Try it now! Request a short demonstration via Skype. 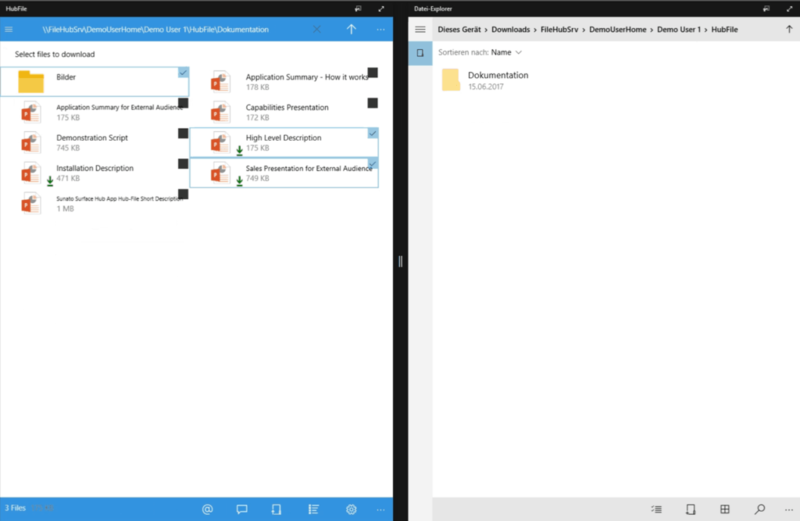 Or download the demo version for first tests from the Windows Store (runs on your Windows 10 device and on Surface Hub): HubFile und Shorty. Please send us an eMail so that we answer your questions, send you demo- or license-descriptions or other sales/ tech material. Do you have any questions concerning Surface Hub? Or requirements beyond our todays apps – for example to integrate your PIM, SAP, Dynamics or legacy system? No problem! Our experts will answer them! Come by or chat with us via Skype – just as you like. 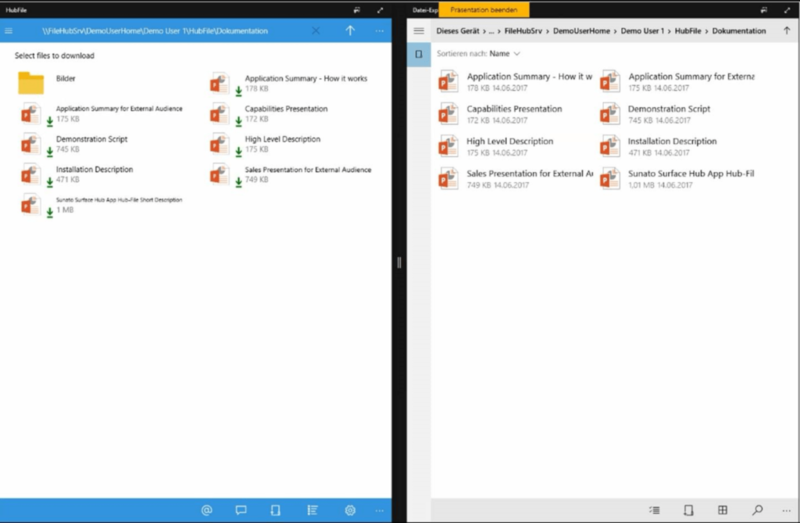 And integrate apps with any of your backend applications or devices.